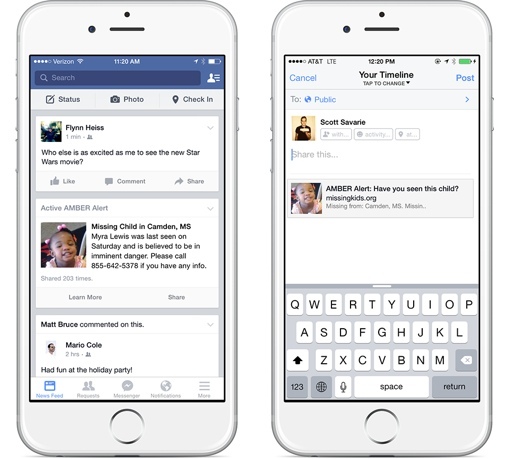 AMBER alerts, the United States’ child abduction alert system, is coming to Facebook. Today, the social network announced a partnership with the National Center for Missing and Exploited Children to help bring timely information about missing kids to Facebook members located in targeted search areas. When your local authorities issue an AMBER alert, relevant information will be shared with Facebook via the National Center for Missing and Exploited Children – the child’s name, description and photograph, along with a description and license plate of the suspected abductor. If you’re in the same geographic area the missing child is believed to be in, the alert will appear in your News Feed. You can then share the alert with your friends or link directly to the missing child’s poster with the most up-to-date information available about the case. According to Facebook, the new initiative was inspired by a number of good Samaritans who have been sharing offline AMBER alerts with their friends on the social network for some time. In 2014, a missing 11-year-old Baltimore girl was safely recovered in South Carolina thanks to AMBER alert information being shared between Facebook friends. “I am thankful my friend posted the alert, and I am thankful that God placed me in the office when they checked in and that I had time to stop and check Facebook when I did,” explains Carol Gause, the heroic motel owner who recognized the missing child from the alert and contacted authorities. The new Facebook AMBER alerts will not cause push notifications to be issued, so there’s no worry about loud interruptions at the wrong time or having to shut the emergency notifications off. And you'll only get alerts for children believed to be located somewhere in your immediate area, so they're definitely worth paying attention to – you could wind up saving a child's life. For more information, you can visit the Facebook News Room blog or the National Center for Missing and Exploited Children’s official Facebook page. This is great! I think its a good way to tell the community whats going on, to keep their eye open just in case the see something. its a great use of the Facebook media.